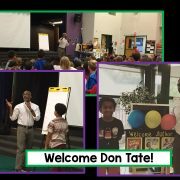 Welcome Don Tate, Author and Illustrator!! 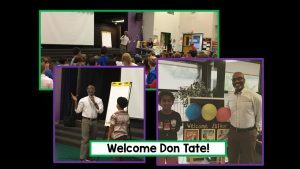 Third, Fourth, and Fifth Graders had the wonderful opportunity to meet and hear from Don Tate who has written and illustrated over 50 children’s books! 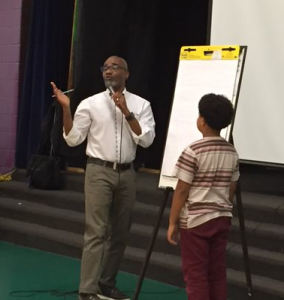 What an awesome way to boost creativity, a love of reading and drawing, and learn about how to become an author or illustrator one day. Don’t forget to head to Papa Murphy’s this week to support DJ Montague’s fabulous PTA. Mention DJ Montague to receive $3.25 off your pizza and $3.25 is matched and given back to our school. Need easy and delicious dinner plans this week, we have you covered! Hope to see you there. I hope this letter finds you and your family safe and dry. We are off to a great start, and I am excited to begin a new school year. I hope the transition back to school has gone smoothly for your family, particularly those of you who are sending a child to school for the first time. The students are adjusting well, learning classroom and school routines, making new friends and reconnecting with old friends. We are looking forward to a successful year! It is my pleasure to welcome Ms. Pat Chappell to the D.J. Montague staff. Ms. Chappell is a veteran educator with 20 years of teaching experience in Williamsburg-James City County. This is a bit of a homecoming for Ms. Chappell who worked at D.J. Montague from 1997 – 2010. Now, after a brief retirement, she has decided to return to the classroom. Ms. Chappell will be serving our kindergarten – second grade gifted students. We are excited to welcome Ms. Chappell back to our Mustang family and look forward to the many ways she will engage our students in their learning. In accordance with the Code of Virginia and Accreditation Standards, one fire drill will be held each week for the first month of school and one each month for the remainder of the school year. Additionally, public schools are now required to conduct two lockdown drills during the month of September and two during the second semester, one of which must be held in January. The first drill will be conducted by our school staff and other drills may be conducted by members of the James City Police Department. During this and any other drills, parents and visitors will not be permitted to enter the building. Students have done an excellent job during the drills that have already been conducted. This year we are focusing on fostering a growth mindset in our students. We all want our children to work hard, be risk takers and succeed, but our choice of words may be conveying a different message. In her book, Mindset: The New Psychology of Success, Carol S. Dweck differentiates between a growth mindset and a fixed mindset and the role we as parents and teachers have in developing the growth mindset. I would like to share with you some ideas about what she calls the fixed mindset versus the growth mindset. Simply, the fixed mindset message says: You have permanent traits and I’m judging them. The growth mindset says: You are a developing person and I am interested in your development. I frequently lavished praise on my children for doing something well or succeeding in the hope of encouraging confidence and achievement. My comments included, “You are so smart.”, “You’re a natural athlete.”, “Look how well you did without even studying.” Dweck’s studies show that the message children hear is quite different. “If I don’t learn something quickly, I’m not smart.”, “I’d better quit studying or they won’t think I’m brilliant.” Children like to receive praise for their intelligence and talent, but that boost is short lived. Once something is difficult or challenging, that confidence and motivation fall by the wayside because if success means they are smart, failure means they are stupid. This is the fixed mindset. So what can we say to let our children know we are proud of their successes? Rather than praising their talent or intelligence, we should praise them for the growth oriented process – for their effort and accomplishments achieved through practice, study and persistence. Comments like, “You really studied for your test and your improvement shows it.”, “I like the way you tried many strategies on that math problem until you solved it.” and “That assignment was so long and involved. I admire how you concentrated and finished it.” As Dweck stated, “If parents want to give their children a gift, the best thing they can do is to teach their children to love challenge, be intrigued by mistakes, enjoy effort, and keep on learning.” Ask your child about the power of yet! It is important that we work together to make this school year a successful one for your child and your family. If you have any questions, concerns or feedback, please don’t hesitate to contact me at catherine.vazquez@wjccschools.org or 757-258-3022.